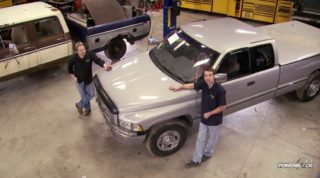 1971 C-10 Cheyenne Door Replacement : Trucks! Trucks! replaces a door on the 1971 C-10. 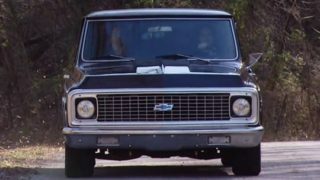 We find a 1971 C-10 Cheyenne for a new project. We're doing an LS engine swap on our 1971 C-10. 1971 C-10 LS Engine Swap! We're installing a 6.0 LS engine in our 1971 C-10. 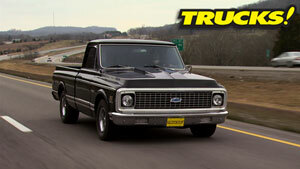 We're taking our 1971 C-10 out for a test drive with its new LQ4 engine. 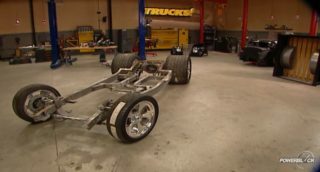 We're upgrading the suspension on our 1971 C-10! Trucks! 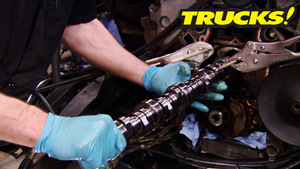 is upgrading the differential on their '71 C-10 and adding one piece glass! (KEVIN)>> HEY, WELCOME TO TRUCKS. WELL WE LOVE OUR '71 C-10. IT'S GONNA BE AN AWESOME PROJECT, BUT THE MORE WE LOOK AT IT, THE MORE WE REALIZE IT'S KIND OF A 20 FOOTER. THE CLOSER YOU GET, THE MORE STUFF YOU SEE THAT NEEDS TO BE DONE. HOWEVER, IT'S A 40 YEAR OLD TRUCK. SO IT'S ALLOWED TO HAVE A FEW LITTLE WARTS HERE AND THERE. CASE IN POINT, CHECK THE DOOR OUT. NOW THE FIRST CLUE THAT SOMETHING'S NOT QUITE RIGHT IS THE MISALIGNMENT BETWEEN THE TWO BODY SIDE MOLDINGS. YOUR FIRST GUESS MIGHT BE THAT THE DOORS KICK DOWN, BUT IF YOU LOOK AT THE CONTOURS AND THE STYLE LINES UP HERE, THE DOOR'S IN THE RIGHT PLACE AND THE FENDER'S IN THE RIGHT PLACE. SO STRIKE ONE, LOOK A LITTLE FURTHER SOUTH. HERE THE MOLDING IS MISALIGNED BUT RIGHT HERE, THIS DOOR IS HIGHER THAN THE FENDER. THAT'S REALLY NOT GOOD. EVEN DOWN AT THE BOTTOM OF THE ROCKER IT'S, WELL, IT'S NOT LINED UP RIGHT. BUT RIGHT HERE, HERE'S YOUR CULPRIT. THIS IS RUST! 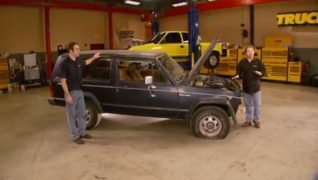 (KEVIN)>> NOW I KNOW YOU'RE PROBABLY SAYING DOORS CAN BE PATCHED. AND YES YOU'RE RIGHT, THEY CAN. YOU DON'T NEED TO REPLACE THE WHOLE DOOR EVERY SINGLE TIME, BUT HERE'S WHAT SEALS THE DEAL FOR ME. CHECK IT OUT, 1978 SIX BY NINE SPEAKER, AND THERE'S A GIANT HOLE IN THE DOOR FRAME. I DON'T WANT THAT. WE'RE GONNA USE KICK PANEL SPEAKERS, OR SOMETHING BEHIND THE SEAT, OR SOMETHING A LITTLE MORE MODERN THAN THESE GUYS HERE. SO BETWEEN THIS, THE RUST, THE MISALIGNMENT, THE SHIFTED DOOR FRAME, STRIKE THREE! THIS DOOR IS OUT OF HERE. 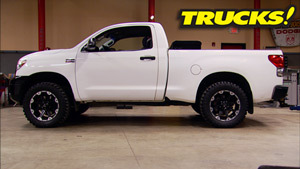 WELL FORTUNATELY FOR YOU AND ME WE LIVE IN A TIME WHERE REPLACEMENT PARTS FOR THESE AND MANY OTHER TRUCKS ARE EASILY AVAILABLE, JUST A PHONE CALL AWAY. 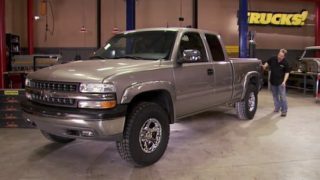 WE'VE DEPENDED ON LMC TRUCK MANY TIMES IN THE PAST. WE ARE AGAIN WITH THIS DOOR SHELL. THIS IS FOR OUR TRUCK. 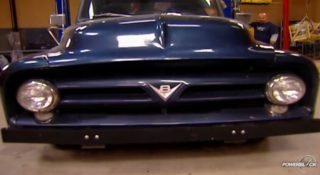 IT'S FOR A '67 TO '71 C-10 CHEVROLET. THE STAMPING LOOKS GREAT. IT'S GOT THAT ELECTRIC DEPOSTION COATING INSIDE AND OUT. SO CORROSION, WELL WE'RE GONNA GET AHEAD OF THAT GAME RIGHT FROM THE START. BEFORE WE CAN PUT THIS ONE ON, WE'VE GOT A LITTLE BIT OF TEAR DOWN TO DO. NOW WE'LL PROBABLY KEEP MOST OF THIS TRIM. BUT EVEN IF YOU'RE NOT, KEEP UP WITH THE CLIPS AND SCREWS, SOME OF THEM ARE SPECIALIZED. BUT THE SPEAKERS, WELL THEY CAN GO AWAY. THE TRIM PANEL RETAINERS STAY BECAUSE THEY CAN BE POLISHED UP, BUT THE TERMINATOR LOCK GUYS, THEY WON'T BE BACK. NOW IF WE NEEDED ANY MORE COMFIRMATION FROM THE FACT THAT WE NEED TO REPLACE THIS DOOR, TAKE A LOOK AT THE RUSTY MESS DOWN INSIDE HERE. NOW THE INSIDE OF THIS DOOR LOOKS MORE LIKE THE SURFACE OF THE MOON THAN THE INSIDE OF A SHEET METAL PANEL. HECK, IT EVEN LOOKS LIKE A DIVE SITE, LOOKING FOR THE TITANIC RUINS. YEP, TOAST! NOW INSIDE THE NEW LMC DOOR, OBVIOUSLY THERE'S NO CORROSION. IT'S BRAND NEW, BUT WHAT YOU DO SEE IS THE ELECTRIC DEPOSITION COATING ON THE INSIDE OF EVERY PANEL AND EVERY PINCH SEAT. PLUS THE DRAIN HOLES ARE WIDE OPEN. SO IT'S PRETTY OBVIOUS THAT PUTTING DOORS ON THIS TRUCK IS THE RIGHT THING TO DO. HOWEVER, BEFORE WE DO THAT, ANOTHER ISSUE COMES UP WITH PRETTY MUCH ANY VEHICLE THAT'S MORE THAN A FEW YEARS OLD, AND THAT IS THIS. THESE HINGE PINS AND BUSHINGS ON THE DRIVER'S DOOR ARE SHOT. THE BUSHINGS ARE SACRAFICIAL ANYWAYS, AND ARE KINDA DESIGNED TO WEAR OUT. BUT, JUST OVER AGE AND OVER TIME, AND THE FACT THAT THIS DRIVER'S DOOR TAKES MOST OF THE HEAT, WELL THESE THINGS NEED REPLACED. SO WE WENT ONLINE AND GOT A COUPLE OF PIN AND BUSHING KITS FROM LMC TRUCK. NOW THIS IS A VERY SIMPLE REPAIR, BUT IT'S A VERY NECESSARY ONE. HERE'S HOW IT GOES. NOW TYPICALLY THESE ARE A BEAR CAT TO GET OUT AND HAVE TO BE DRIVEN OUT. PARTS STORE AROUND THE CORNER, BUT FROM LMC YOU GET ONE THAT'S MADE FOR THIS TRUCK AND IT'S A NICE FIT. WITH ALL THE TINY ADJUSTMENTS YOU HAVE TO MAKE. OKAY! THAT ONE LITTLE ADJUSTMENT BROUGHT IT BACK INTO LINE HERE. WE ARE CLOSE ENOUGH TO THROW THE LATCH IN. YOU CAN SAVE A LITTLE MONEY BY REUSING THE ORIGINAL LATCHES, WHICH BOLT RIGHT IN TO THE BRAND NEW DOOR. ONE LAST CHECK FOR INTERFERENCE WITH THE LATCH AND WE'RE GOOD. WE GOT A DECENT GAP, THE DOOR FITS WELL, AND THE BEST THING, THERE IS NO PLAY IN THAT HINGE. OF TAPE BY TACKING ONE END, AND STRETCHING AND LAYING DOWN THE OTHER. WHEN I'M HAPPY WITH THE PLACEMENT, I CAN MARK THE LOCATION OF THE EXPOSED FASTENER. OKAY, NOW THE ONLY THING THAT HOLDS THIS SIDE MOLDING ON IS ONE SHEET METAL SCREW IN THE FRONT AND TWO SPRING STEEL CLIPS. THE CLIPS ARE PRETTY SIMPLE. THEY SLIDE INSIDE THE MOLDING AND THE PIECE OF SPRING STEEL HOLDS IT IN PLACE. IF YOU NOTICE THE PIN IS EXACTLY IN THE MIDDLE OF THE SIDE MOLDING, WHICH IS AN INCH AND A HALF WIDE. SO WE KNOW THAT OUR PIN LOCATION IS THREE QUARTERS OF AN INCH. SO THAT'S REALLY ALL WE HAVE TO FIND. NOW DON'T BE NERVOUS ABOUT DRILLING INTO A BRAND NEW PANEL BECAUSE IF YOU CAN READ A MEASURING TAPE, YOU CAN DO THIS ACCURATELY. I'M STARTING WITH AN EIGHTH INCH PILOT HOLE, AND FOLLOWING THAT WITH A STEP DRILL THAT WE GOT FROM MATCO TOOLS. A STEP DRILL IS A REALLY HANDY THING TO HAVE IN THE SHOP, AND THEY COME IN HANDY HERE BECAUSE THE INCRIMENTS AND THE WIDTHS ARE MARKED ON THE DRILL. SO YOU CAN DRILL WITH ACCURACY. ONCE YOU KNOW THERE'S NO INTERFERENCE WHEN YOU OPEN THE DOOR, YOU CAN INSTALL THE OTHER HARDWARE, WHICH IS DONE FROM THE BACK SIDE OF THE DOOR. THE FIRST ONE BEING IN THE DOOR JAMB, THE OTHERS INSIDE THE DOOR SHELL ITSELF. ALRIGHT, IT'S LOOKING BETTER ALREADY. WE'VE GOT ONE MORE TO GO. NOW WITH THE LOWER MOLDING IT'S SECOND VERSE SAME AS THE FIRST, BUT YOU STILL HAVE TO DO A LITTLE BIT OF MEASURING. FINE LINE TAPE IS A GREAT GUIDE, AND PINS FOR THE CLIPS ARE DEAD SET IN THE METAL JUST LIKE THE UPPER MOLDING. AGAIN WE'RE STARTING WITH OUR EIGHTH INCH PILOT HOLE FOLLOWED BY THE MATCO STEP DRILL. SEE A PATTERN? NOW EVEN IF THE LOCATION OF YOUR HOLES IS NOT EXACTLY THE SAME AS THE ORIGINAL FROM SIDE TO SIDE, DON'T FREAK OUT BECAUSE THE CLIPS CAN SLIDE INSIDE THE CHANNEL OF THE MOLDING, WHICH ALSO GIVES YOU THE ABILITY TO ADJUST IT FOR A PERFECT FIT. (KEVIN)>> HEY WELCOME BACK TO TRUCKS. WELL OUR BODY SIDE MOLDINGS ARE ON AND THEY'RE IN THE RIGHT PLACE. NOW WE JUST SHOWED YOU HOW TO GET A PERFECT ALIGNMENT THE FIRST TIME INSTALLING THESE THINGS. NOW OBVIOUSLY THE DOOR HANDLE, LOCK CYLINDER, AND THE REST OF THE WINDOW TRIM ARE NOT ON THIS DOOR. WE'RE GONNA WAIT UNTIL AFTER WE'VE SHOT PAINT ON THIS THING TO ASSEMBLE IT. WE ONLY NEED TO DO IT ONCE THAT WAY. BUT THERE IS ONE MORE THING THAT I WANT TO MAKE YOU AWARE OF. I'M USING THE REFLECTION OF MY HAND AND SOME CREATIVE LIGHTING TO SHOW YOU THESE DIMPLES ALONG THE BOTTOM SIDE OF THIS BODY SIDE MOLDING. NOW THIS CAN BE CAUSED BY A COUPLE OF DIFFERENT THINGS. EITHER HAMMERING THE MOLDING INTO PLACE ON THE EXISTING HOLES, OR BY OVER DRILLING USING TOO MUCH FORCE ON THE DRILL. AND WHEN THE DRILL FINALLY GOES THROUGH THE METAL, WELL IT SMACKS THE SIDE OF THE PANEL CREATING ACTUALLY A DENT IN THE SIDE. OE QUALITY SEALS, DIAPHRAGMS, AND CHECK VALVES THAT ARE INSTALLED IN EVERY SINGLE UNIT FOR LIKE NEW PERFORMANCE. 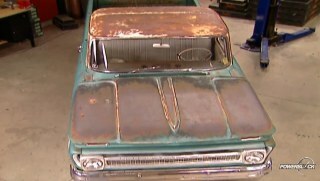 AND THE RUST PROHIBITIVE COATING, WELL IT'LL GIVE IT A LONG LIFE IN HARSH CONDITIONS. 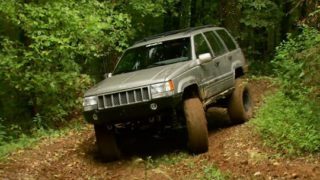 NOW GETTING YOUR BRAKE SYSTEM BACK UP TO OE SPECS IS TECHNICALLY NOT NECESSARILY AN UPGRADE, BUT ANY TIME THAT YOU CAN INCREASE RELIABILITY AND SAFETY, WELL IN MY BOOK THAT IS AN UPGRADE. AND ROCK AUTO DOT COM IS THE PERFECT SOLUTION. (KEVIN)>> HEY WELCOME BACK TO TRUCKS. WELL YOU GUYS HAVE SEEN US WORK ON THE SEARCH AND RESTORE F-350 A TON, MAKING IT EVEN BETTER FOR GOING ALL ACROSS THE COUNTRY AND PICKING UP PROJECT VEHICLES. 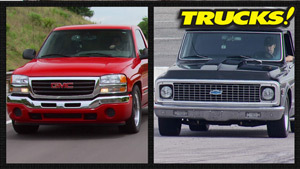 ONE OF THE WAYS WE'VE IMPROVED BOTH FUEL ECONOMY AND PERFORMANCE IS WITH A BULLY DOG TUNER. BUT TUNERS ARE NOT JUST LIMITED TO LIGHT DUTY VEHICLES. CATERPILLAR C-15 UNDERNEATH ITS GIGANTIC HOOD. THE FACTORY PCM AND EXTRACTS THE FACTORY SETTINGS AND STORES IT IN THE TUNER. THEN YOU HOOK UP THE TUNER TO THE INTERNET, CONNECT TO BULLY DOG'S DATABASE, AND YOU CAN ACCESS THE LATEST TUNING FILES AVAILABLE FOR YOUR APPLICATION. THEN IT'S JUST A MATTER OF PLUGGING THE GT BACK INTO THE TRUCK AND DOWNLOADING THAT FILE. NOW DEPENDING ON WHAT POWER LEVEL YOU CHOOSE OR WHAT TUNE YOU CHOOSE, YOU CAN TRY TO MAXIMIZE FUEL ECONOMY, OR YOU CAN PICK UP HORSEPOWER, AND TORQUE, AND FUEL ECONOMY. NOW LETS SEE HOW THIS THING DRIVES. 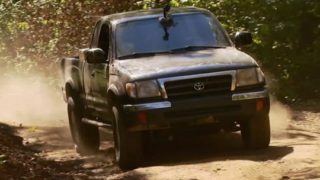 NOW THIS THING MAKES A TON OF HORSEPOWER AND TORQUE, BUT IF YOU'RE PULLING A HEAVY LOAD UP A STEEP MOUNTAIN SIDE, WELL 18 PERCENT MORE HORSEPOWER AND TORQUE SURE COMES IN HANDY. AND TO MAKE SHIFTING EASIER, IT'S GOT A FEATURE CALLED THE GEAR MASTER. (KEVIN)>> NOW BACK IN THE '80'S I DROVE AN OLD WHITE ROAD BOSS, IT TOOK A LOT OF FINESSE TO FLOAT THROUGH THE GEARS WITHOUT GRINDING ANYTHING OR THROWING THE LOAD AROUND IN THE BACK. BUT WITH THE GEAR MASTER IT MATCHES YOUR RPM AND SPEED, SHOWS YOU THE NEXT AVAILABLE GEAR, WHICH NOT ONLY CUTS DOWN ON ENGINE WEAR AND TRANSMISSION WEAR, BUT IT'S A GOOD SAFETY FEATURE AS WELL. ESPECIALLY IF YOU'RE IN WINTER CONDITIONS AND YOU'RE ON A HILL AND YOU MISS A GEAR. NOW PULLING A LITTLE BIT MORE FUEL ECONOMY OUT OF YOUR VEHICLE IS A NICE OPTION TO HAVE IN A PASSENGER VEHICLE. 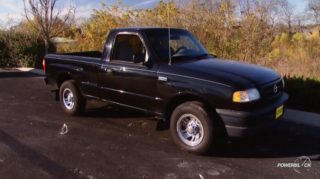 BUT IN AN OPEN ROAD TRUCK LIKE THIS, ESPECIALLY WHEN YOU'RE AN OWNER/OPERATING PUSHING MORE THAT 120,000 MILES A YEAR, IT CAN MEAN THE DIFFERENCE BETWEEN A PROFIT OR A LOSS. (KEVIN)>> NOW JUST LIKE WITH A PASSENGER VEHICLE, ELECTRONICS ARE NOT THE ONLY WAY TO INCREASE PERFORMANCE IN A BIG RIG. 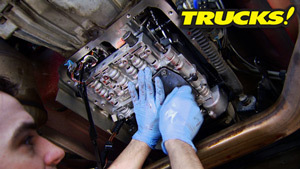 CHECK OUT THIS REPLACEMENT MANIFOLD FROM BULLY DOG TECHNOLOGIES. POLISHED ALUMINUM COMPRESSOR HOUSING AND A FORGED ALUMINUM COMPRESSOR WHEEL. CHARGE WHEN YOU ORDER ONE. SO WHETHER YOU'RE AN OWNER/OPERATOR OR A FLEET MANAGER AND YOU'RE LOOKING TO GET A LITTLE BIT MORE POWER AND EFFICIENCY OUT OF YOUR FLEET OR YOUR TRUCK, YOU MIGHT WANT TO THINK ABOUT BULLY DOG TECHNOLOGIES. CHECK OUT THEIR WEBSITE FOR ALL THE DIFFERENT APPLICATIONS ON THESE AND OTHER PARTS. 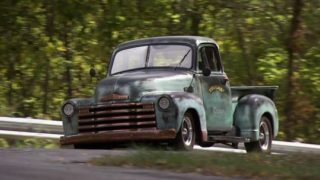 THANKS FOR WATCHING TRUCKS, SEE YOU GUYS NEXT TIME.